From its original conception in the 1960’s until the Ohio and Erie Canal Towpath Trail was completed in 2012, it took roughly half a century for the Akron portion to be complete. Modern land use and laws are far more complex now, but the Ohio & Erie Canal was originally built in 9 years – all 308 miles. That’s not a knock on the Towpath Trail…far from it, actually. It has been remarkable to witness and be a part of something that has transcended a generation. This Towath Trail connects people and places like no roadway could ever aspire to accomplish. What’s more inspiring is that time has not diminished interest in the Towpath Trail. If anything, it has allowed it to blossom. The iTowpath portion of the trail is the latest example that the original vision is still very much alive and well. 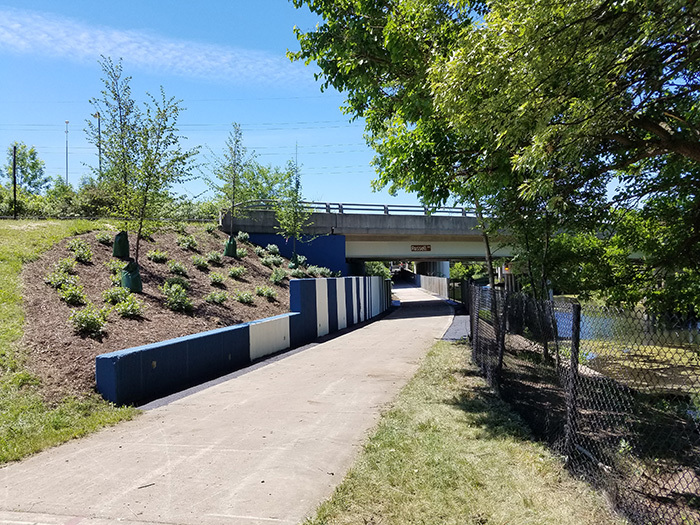 iTowpath is a grassroots effort funded by The Knight Foundation, the Akron Community Foundation, GAR Foundation and many others to improve the Towpath Trail experience through downtown Akron. Some planned improvements include wayfinding signage, bike lanes, public art, connections to Akron attractions, gateway arches, and underpass enhancements. For me, underpasses are where my story begins. 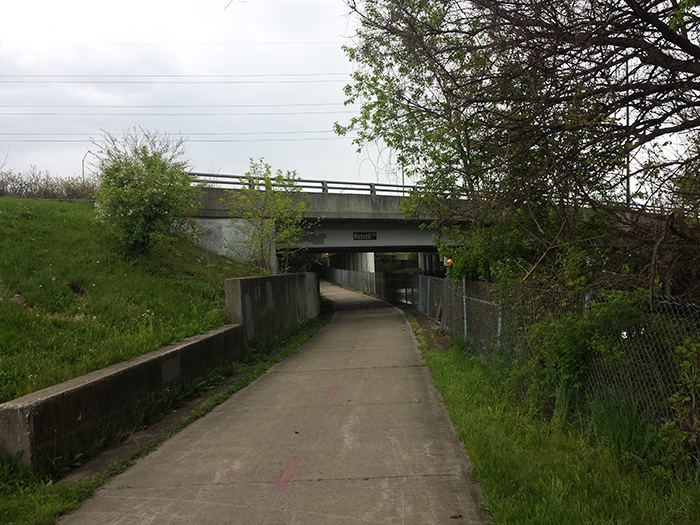 Underpasses in Akron have largely been utilized for Towpath Trail thoroughfares on a journey to somewhere else. Most people don’t think, ‘hey, I think I will go down to the underpass for a walk, or meet my friends.’ But, what if they did? 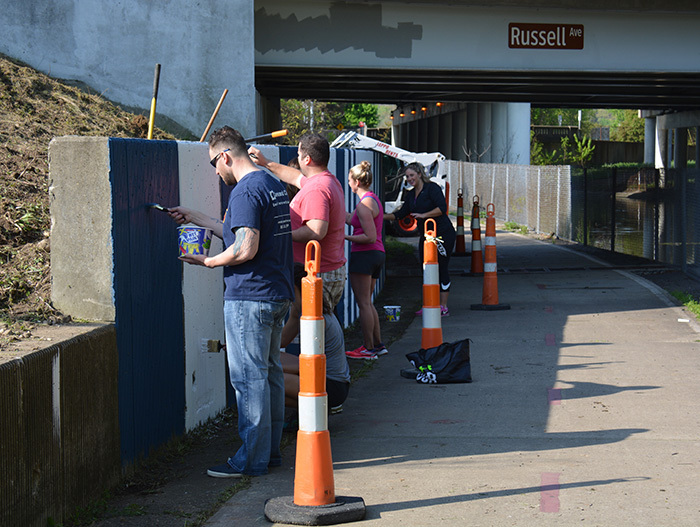 As part of iTowpath, the Ohio & Erie Canal Coalition’s (OECC) Associate’s Board adopted Russell Avenue underpass as a test project to figure out what could work and how to perform the improvements. It is the first underpass to undergo the transformation from space into place. In the future, there could be nine more underpasses to go through this same transformation. 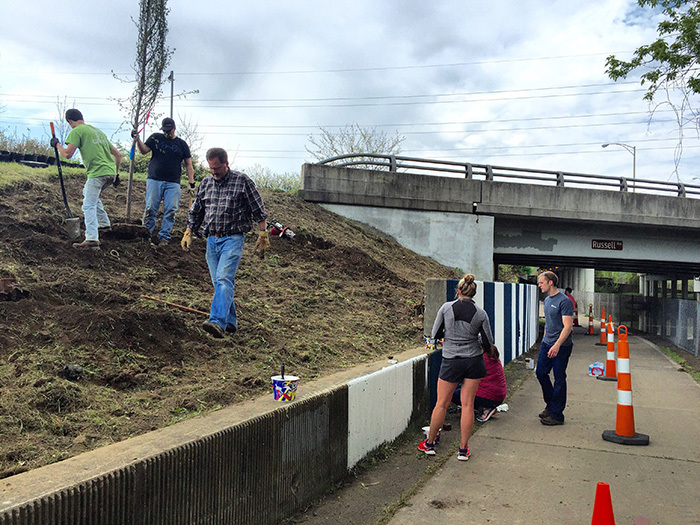 So far, improvements include painting, landscape bed replacement, and removal of overgrown vegetation. All of this work was completed by volunteers. 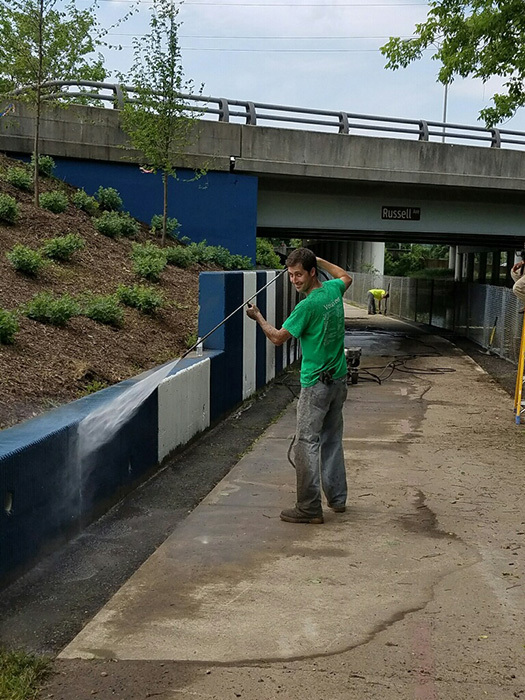 While iTowpath has relied on assistance from contractors and designers, it also relies heavily on the true grit and determination of volunteers, and support from area residents and businesses. I was pleasantly surprised when January Paint and Wallpaper donated thousands of dollars of supplies and materials to help complete work. This is one example of how the initial funding is going even further because of people’s interest in the Towpath Trail. The Towpath Trail is a very well-traveled corridor, and through construction, traffic didn’t slow down. It was extremely rewarding to see people’s excitement as they approached the underpass to experience the improvements. And after the work was complete, I remember hearing comments about how bright and open the underpass looked. Prior to the transformation, it felt like you were going through a dark tunnel, and with soon to be installed lighting enhancements, that new feeling will be complemented with an appealing glow that will even change color based on time of day! Russell Avenue is a narrow underpass that has been given an identity, but other underpasses will provide opportunities to not only become places, but destinations. Imagine a mini park, an engaging public art installation, a colored light show, an amphitheater, skate park, or adventure playground happening where a barren space exists today! It brings personality, charm, and provides a sense of place. As I ride the Towpath Trail now with my daughter, I realize what she will have access to because of a big idea and persistent determination. It’s amazing to be a part of history as it repeats itself. The Towpath Trail may be more than a half century in development, but it is part of a 191-year-old dream about a transportation corridor that is still paying dividends. In this case, history repeating itself has been nothing but good. What are your underpasses doing for you? Don’t be afraid to take another look at “completed” projects, because this experience has allowed me to re-think my own approach to transforming spaces, and as a landscape architect, I think that trying is not failing, but failing to try…well, that’s another story.